Gel Nail Polish for Glossy, Chip-Free Manicures. A flawless manicure is essential for true fashionistas and now, with the help of this innovative nail color product, the gel nail polish, nail art enthusiasts can now have perfectly polished nails up to three weeks without having to turn towards weekly mani sessions or acrylic nails. Find our more details about gel nail polish! Keeping your nails perfectly polished for days in a row can be quite difficult considering that nail polishes chip easily especially when frequently exposed to water. Thankfully, the innovative products that seem to pop up constantly in the nail care industry have led to the development of gel nail polish, a must try for true nail art enthusiasts who want to enjoy a long lasting manicure without all the fuss. Gel nail polish is a product that combines the beautiful pigmentation of nail polish with the long lasting effects of acrylic nails, so you can keep your nails natural and looking fabulous for up to three weeks. How can you not fall in love with a product that enables you to save plenty of money on regular nail salon trips?! If you can apply nail polish on your own, opt for a home kit and polish your own nails to perfection and if you're not too skilled when doing your own nails, opt to swap the traditional salon manicure using regular nail polish for gel nail polish or as it is also known, soak-off gel. This way you'll be able to enjoy your mani for longer without dealing with chips and pealing polish and save money in the long run as you'll only have to do your nails every two or 3 weeks. 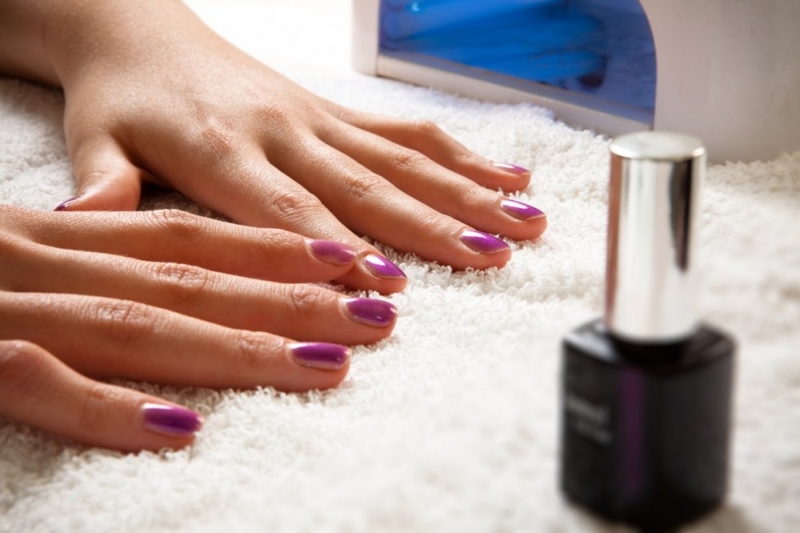 The application process is quite easy to master if you can polish your own nails without getting any polish on the skin. To get your nails looking fabulous you'll first have to remove the shine from your nails using a buffer, for better adherence, push and remove cuticles, rub alcohol on the nails using the lint free wipes and apply the gel base coat. Cure the nails for two minutes before applying the colored gel nail polish. After you've applied the color on all the nails without getting the color on your skin cure the color for another two minutes. If you're looking for a more intense coloration, you can apply another layer of color and cure again. Apply a thin coat of gel nail polish top coat and cure again the nails for another 2 minutes. The nails will have a sticky finish which you'll have to remove using a lint free wipe dipped in alcohol. Now your nails will be shiny, strong and ready to enchant your eyes for up to three weeks. The removal process of the gel nail polish is easy: just gently file off the surface and soak your nails in acetone for 15 minutes before using the cuticle pusher (file) to remove any traces of the color. The benefits of this ingenious products include long lasting results without chipping for up to 21 days, perfect for natural nails, you can layer nail polish on top if you wish to switch things up a bit with your color. However, that doesn't mean that there are no disadvantages when it comes to soak-off gel as the entire kit might be a bit pricy. If you're using an intense pigmented gel polish, you're going to see nail growth after a week or so, which is not quite flattering (however this is the same as with acrylic nails), the time needed to cure the nails. Any product has its pros and cons, but what do you think? Are you going to give this a try?